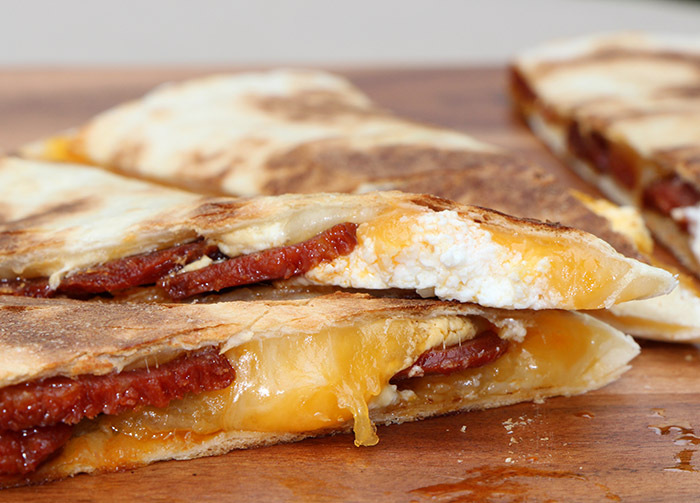 These tangy and gooey quesadillas are a great starter for your BBQ. The chipotle aioli really plays off of the chorizo very well. In a cold 10” non-stick skillet add the oil and the sliced chorizo and place over a medium-low flame. (We are starting the rendering process in a cold pan to allow for a slow rendering of the fat, for better flavor and less chance that you will burn your chorizo before its finished!) Occasionally stir the chorizo and cook until most of the fat is rendered out and the chorizo is crispy and brown-about 8-10 minutes. As the chorizo renders it will turn the pan a bright orange color (this is the paprika in the sausage) and this is a good indicator that your sausage is close to being finished! Once the chorizo has ben rendered, place the cooked sausage on a paper towel lined plate to drain. Clean out the pan that you just rendered the chorizo in and preheat it on a med low heat. While the pan is heating place one of the tortillas on a clean work surface and place 1-2 ounces of the crumbled goat cheese, 3-4 tablespoons of the cheddar and jack cheeses and a generous handful of the chorizo on one half of the tortilla. Fold the empty half over the loaded side, press firmly and place in the preheated pan for 2-3 minutes-until golden brown. Turn the tortilla and cook until golden brown and the cheeses are melted and gooey-about 2-3 minutes. Repeat with the remaining ingredients. Place quesadilla on a cutting board and cut in half. Cut the halves into thirds and serve warm with the chipotle aioli. The quesadillas can be made up to four hours in advance and can be reheated in a 500 degree oven on a rimmed sheet pan for 5-7 minutes until heated through. *Chorizo sausage is made two ways. The first is Mexican style, which is uncooked and looks very similar to sausage that you would buy in the meat case at your local supermarket. The second is Spanish (what this recipe calls for) and is a dried, cured pork product that usually contains paprika, cumin and garlic as spices to name a few. As it is dried, it requires no refrigeration and can be eaten just as you would any other type of dried meat! This is a secret ingredient in my Chile and is also great with eggs, chicken, roasted clams and soups!